"I just wanted to say thank you for the excellent care our sweet Bella received last week when she had a dental. We came in for what I thought would be a simple dental cleaning, but things became much more involved when there was a tooth extraction, 2 cavities filled, and gum tissue shaved down. Additionally, there was a bad rash behind both of Bellas ears and a biospy taken. Dr Davis also removed a growth on her leg and sent that for biopsy. It was a rough day for Bella and also for us dog parents who worried about Bella constantly. Please send my gratitude to Dr Davis for the excellent care he provided. Thank you for taking the time to explain everything. I would also like to thank everyone in the office we came in contact with for being very caring and informative." I really mean every word of what I said. My husband and I could not be more pleased with Dr. Davis and his staff. They are highly skilled and extremely compassionate people. That is who I want caring for my family. We can't thank you enough for saving Sally for us - we didn't have to make that awful choice of ending her life or trying to lessen her pain. Dr. Davis stopped the pain." "Well, let's start with the word "excellent". If it weren't for Dr. Davis and his staff, Doc might not be here today. Dr. Davis and his staff are the perfect combination of compassion and knowledge. Doc remains healthy to this day. Again, if it weren't for your clinic, Doc might not be with us. I was a critical care therapist, wish people were treated this well!" "Had it not been for Dr. Davis and his equally caring staff when Pippin's lower mandible was horribly damaged having been hit by a vehicle, we'd probably not have our saucy Lhasa! He shows NO problems from that trauma - neither visible or when eating, playing, or shaking the B-jeebers out of a toy! The situation was very serious; our local vet was duly impressed. Every one at the clinic treated Pippin and us as family. "I'm happy to write about my experience with you wonderful people. Tomo is my seal point traditional Siamese. He's had gingivitis for most of his life, and had his first dental cleaning when he was only 18 months old. He's had one roughly annually since then. When he was about 8 years old, the problem became more pronounced. There were times when he would have trouble eating. Initially, this was managed with antibiotics and occasionally steroids, but when he was closing in on 10 years old, it was clear that this was no longer effective. My normally friendly and social boy was grumpy and hiding; he was also losing weight. When yet another dental cleaning brought him no relief, we were referred to Dr. Davis. Tomo was treated with gentle kindness, which brought him out of his shell a bit. Dr. Davis explained the problem in great detail. I was very impressed with the meticulous evaluation (color photos! full mouth x-rays! both before and after treatment! ), which rivals anything a human patient might expect. Dr. Davis found that all of Tomo's teeth were badly decayed, and recommended that they all be extracted. I was very pleased with the attention to pain management and supportive care; Tomo came home with a fentanyl patch and a feeding tube. After about 2 weeks, he began to eat again. I'm pleased to report that he has regained all the weight that he lost, and is back to being his friendly self; the "boss kitty" who rules over 3 other kitties and 2 dogs. He doesn't miss his teeth a bit; he is even able to eat dry food with no problem. He still has some tiny red patches on his gums, but this does not appear to cause him any discomfort. He even chases his tail sometimes, like he used to do when he was a kitten. To see him happy and feeling well is priceless! Tomo will be 11 years old in April, and I look forward to many more years with him. I was very impressed that everyone I encountered at your office displayed such genuine care and concern for Tomo's well-being. There was never a doubt in my mind that he was in good hands. I wouldn't wish stomatitis on another creature, but I believe that the extractions were clearly necessary to restore my boy to health and relieve his suffering, and Dr. Davis's thorough approach accomplished that goal brilliantly. I would recommend your practice to anyone who has a pet suffering with oral health issues. If I ever need such intensive treatment for myself, I would see Dr. Davis first! Tomo and I thank you all so much for your help." 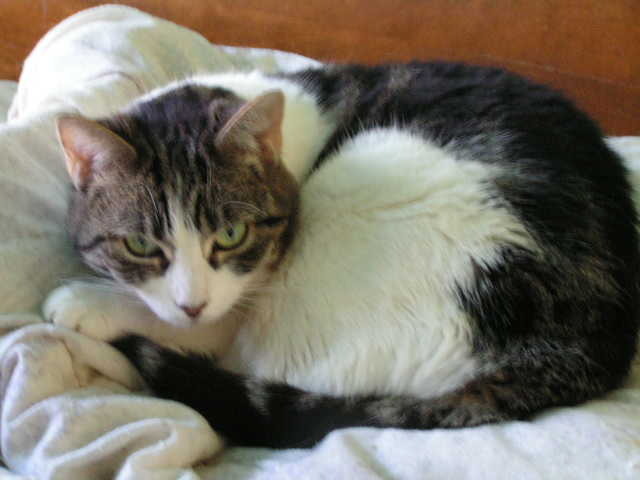 "I was very pleased with the care my cat, Piker, received at Animal Dental Specialists. Dr. Davis was extremely patient, knowledgeable, and compassionate with Piker. I also appreciated the efficiency and kindness of his staff. I felt completely comfortable leaving Piker there for surgery. An excellent clinic for your pet!" Adi and I are both so pleased with the outcome of her dental surgery - her "bite" looks wonderful, but so much more importantly, she is able to eat comfortably and now plays with her toys constantly! Not only do we appreciate your expertise, but your kindness, patience and thorough explanation were so appreciated. And your staff of great ladies always had patience and concern for all my questions and worries. Thank you all so very much!" "My cats, Simon and Josie, were first seen by Dr. Davis in 2010 when they were four years old, after it was found that their dental needs went well above a simple cleaning. Their dental problems were evaluated and both cats were provided with excellent care and treatment by the doctor and his staff. Last year Simon had to have the last of his teeth extracted and I am happy to say he is doing quite well. Without dental treatment, I don't think that would be the case. I am confident in recommending Dr. Davis and his staff in providing for the dental needs of your pets." "We can't say enough good things about Dr. Davis and the staff at Animal Dental Specialists. When we brought Max, our cat, in for treatment he was hanging by a thread due to an auto accident. Your care was not only professional, but extremely compassionate and kind as well. Thanks to your loving care, Max has regained all his health and is back to his old, feisty self. Thank you!" "Eddie and I do not have enough time for all of the good things that we could say about Dr. Davis and staff. Our kitty, Meeps, went from a depressed cat who lived her life in constant mouth/tooth pain, to a kitty with an incredible quality of life. She is now into everything, inquisitive, and playful. She sleeps in the sun and rolls on her belly for belly rubs. If I didn't do some digging online and had been able to read some other reviews written by other owners, we would not have been lucky enough to find your practice. The ride from Connecticut was about 4 hours, but it was worth every minute of it. Meeps appears completely healthy at this point, approximately 6 months after her surgery. Meeps' surgery was only a small part of the experience. Dr. Davis truly bonds with the animal and takes the time to explain everything to the owners. The after-care of Meeps was also well planned with consideration for her inability to eat and drink normally, as well as her pain level and medications to make her comfortable. After receiving Meeps' diagnosis of stomatitis, we felt hopeless because of the often poor outcomes of this disease. I had a renewed sense of hope after our initial visit with Dr. Davis and now we couldn't be happier with the outcome. Thank you." "When my miniature labradoodle was just six months old and her permanent teeth had come in, she chipped a tooth. The veterinarians in my area did not have an animal dentist, but I had already planned a visit to the Syracuse area and I found out about your practice on the internet. I was so relieved to discover that you could repair and save her tooth. During the appointment, I also learned a lot about dog tooth development and dental health. Shasta's teeth had already developed tartar and needed a complete cleaning, and your cleaning and polishing procedure, much like human dental cleaning, was much more thorough and protective than typical veterinary cleanings. I had not trained Shasta to accept tooth brushing, but the online video of "How to brush your cat's teeth" (also works for dogs) helped me through the process and we now follow regular brushing. The cost of this kind of dental care adds to typical vet care for dogs, but I consider it a very worthwhile investment in my dog's long and healthy life. It is encouraging to know that there is something I can do to keep her healthy and comfortable, because dogs can't really tell us when they have a toothache, and by then it is often too late to save the tooth. Thank you for taking such good care of my dear little companion. Best wishes."